Hamilton County Schools Superintendent Bryan Johnson meets with representatives from United Way at the central office building on Thursday, July 12, 2018, in Chattanooga, Tenn. Johnson is wrapping up his first year as superintendent. A timeline of Hamilton County Schools Superintendent Bryan Johnson's first year on the job is at the end of the article. Bryan Johnson likes to rearrange the furniture in his home, positioning the pictures frames and decorations just so. But a week or two later, after noticing the imperfections, he'll rearrange it again, trying to find a better, more effective layout. 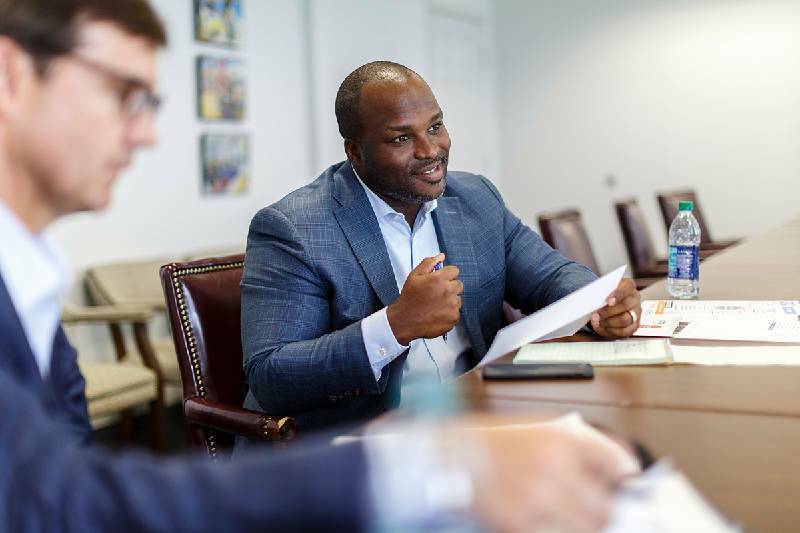 In his first year at the helm of Hamilton County Schools, the state's fourth-largest school district, the 36-year-old has been doing the same — rearranging the district, trying out what might work to create a better, more efficient school system. POLL: Has Superintendent Bryan Johnson done a good job his first year? "When we as a board met to hire a new superintendent, we were talking about how we wanted somebody who was willing to make some bold changes," said school board member Kathy Lennon, of District 2. "He's made those bold changes." Johnson has hired and shifted dozens of positions in the central office and in school leadership roles, launched an effort to tackle systemic problems in the district's historically worst-performing schools, forged relationships with the business community and mediated a new partnership with the state. If school officials were looking for someone to shake things up, it seems they might have found him. On a recent day in July, while driving across the county, Johnson fielded a multitude of phone calls and texts — one from the district's director of facilities, one from a board member, one from a Soddy-Daisy parent. Other superintendents might have handed off the concerns or tasks, but Johnson has his hands in every aspect of the district. 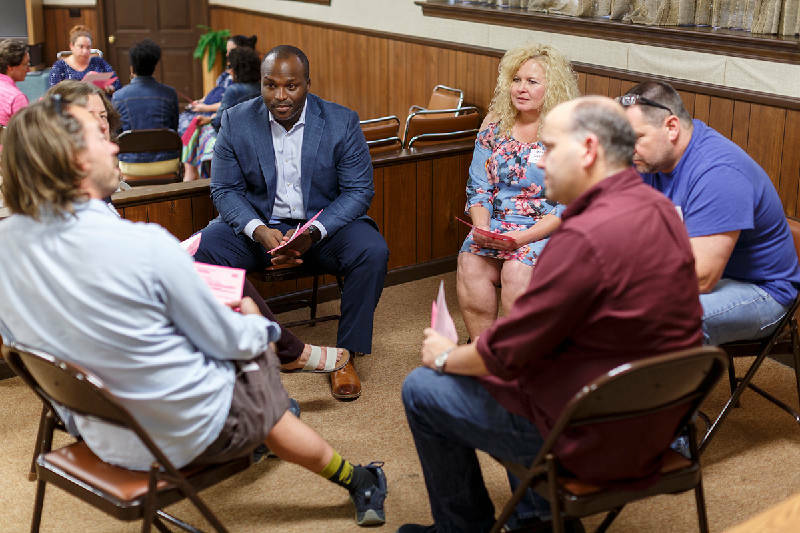 But he says his initial goal was not an upheaval, but to understand the district, the needs of the community and to streamline its strategies to meet those needs. Hamilton County Schools Superintendent Bryan Johnson observes a dispute resolution workshop with teachers at the Hamilton County School building on W. 40th Street on Thursday, July 12, 2018, in Chattanooga, Tenn. Johnson is wrapping up his first year as superintendent. "What we really tried to do is come in and understand the system; what I didn't try to do is come in [on] Day One and wipe the slate and say, 'We're starting over,'" Johnson said. "But to really come in and assess what the needs are here, from the board, from the community as well as from our teachers and our leaders." And Johnson didn't come in to a cushy situation. Johnson was the fourth of five finalists to interview for the position in June 2017 that was vacated after Rick Smith resigned from the role in March 2016. Interim Superintendent Kirk Kelly was among the five finalists, but ultimately, in a 5-4 vote, the board chose Johnson for the job. Since coming into office, Johnson has made more than a dozen staffing changes, including hiring or promoting a team of chiefs, or a c-suite — one of the recommendations of the Mayor's Budget Working Group, organized in 2017 — and dividing the 44,000-plus student district into five learning communities. Central office administrators and even community members credit those communities as one of Johnson's most significant accomplishments so far. Chief of Schools Justin Robertson said the five learning communities have outlined action plans that stretch to the individual school level and factor into an overall comprehensive plan for the district. "One thing we have now that we haven't had in the 10 years that I've been here is a vision and a strategic plan for the district," Robertson said. Jared Bigham, executive director of Chattanooga 2.0, the Chamber of Commerce's hallmark education initiative, is impressed the reorganization spans the teaching and learning department, which is the core of the school system. "I think it's often overlooked how good Dr. Johnson is at the academic side. Most of the time, people look at the general leadership responsibilities of the superintendent's role, but he does an excellent job of positioning the district around standards and aligned assessments in a simplified instructional philosophy," Bigham said. But not everyone has been happy with Johnson, among them school board member Rhonda Thurman, of District 1, who has criticized his staff changes. "I am just extremely disappointed in the way that things have gone in [the] central office," Thurman said earlier this month. "We have gotten rid of a lot of people in central office that [have] had any institutional knowledge." Johnson has insisted that is not the case. Hamilton County Schools Superintendent Bryan Johnson sits in on a dispute resolution workshop with teachers at the Hamilton County School building on W. 40th Street on Thursday, July 12, 2018, in Chattanooga, Tenn. Johnson is wrapping up his first year as superintendent. Many of Johnson's challenges were inherited. 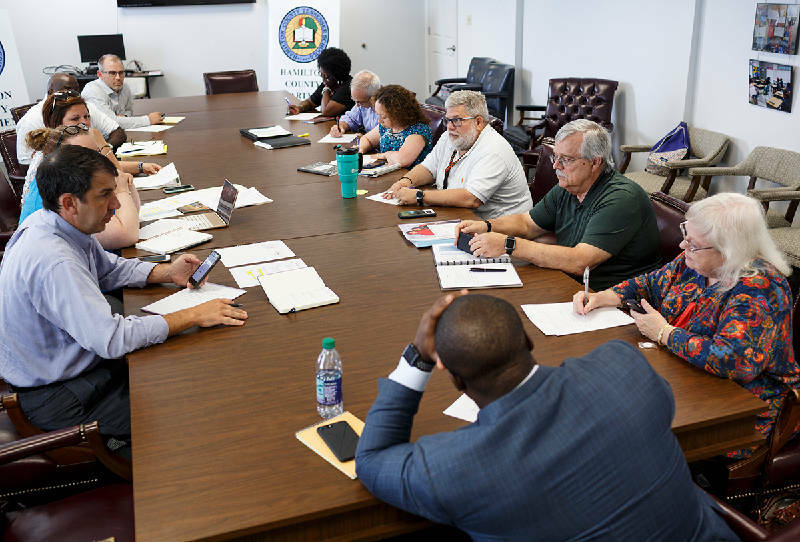 His first major move as superintendent was to establish a plan for 12 of the district's struggling schools, five of which had been threatened with state takeover in 2016 under then-Superintendent Kirk Kelly and were placed into a Partnership Zone with the state. 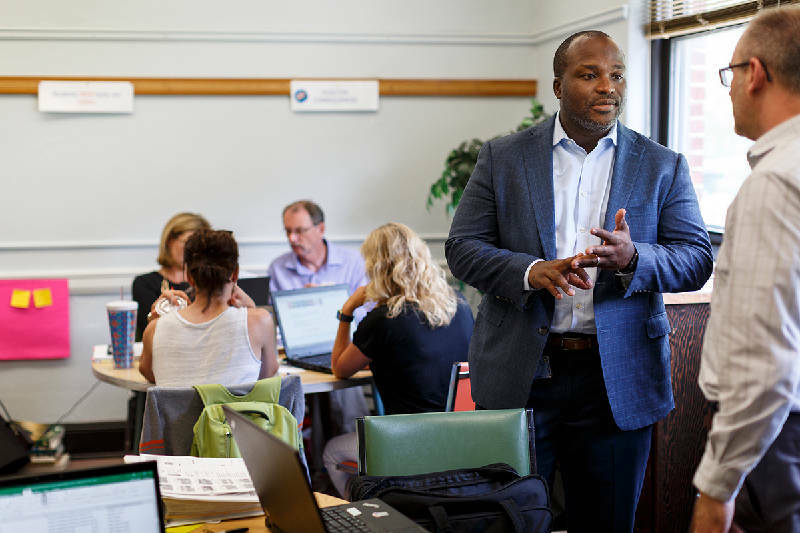 The new Opportunity Zone was designed to support Brainerd and Howard high schools and their feeder patterns, and a leadership team with a chief, elementary and secondary directors, literacy and STEM coaches and more were put in place. 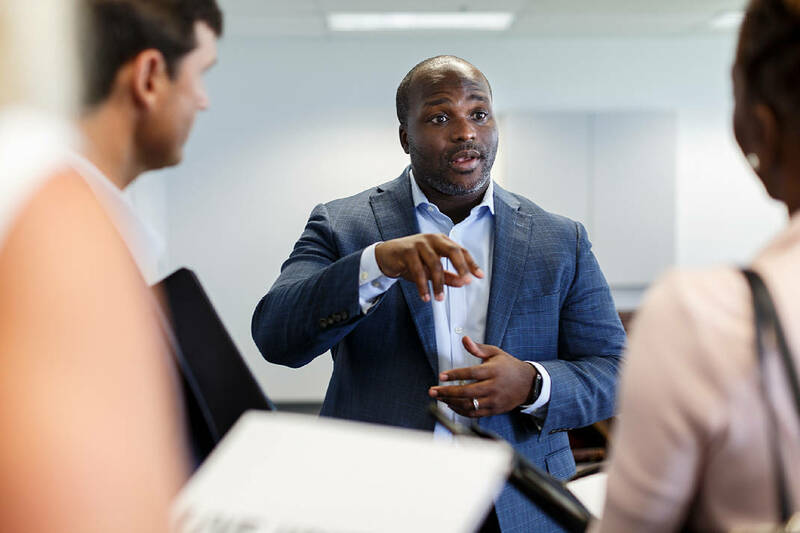 "It impressed me greatly that Bryan's first move as superintendent was to embrace the challenge of our highest needs schools and to urgently develop a strategy for making improvements," said Jill Levine, chief of the Opportunity Zone. "I am so excited for what this will mean for our kids this year." The state credited Johnson's leadership and the creation of the zone when it presented its plan for Brainerd High, Dalewood Middle, Orchard Knob Elementary, Orchard Knob Middle and Woodmore Elementary this spring. The schools, which are in the bottom 10 percent for student performance in the state, will make up the Partnership Network. The network has its own advisory board and is eligible for additional state priority school and federal grants to address the extra needs of the community. Though Johnson inherited the historic low performance of these schools, he has put a team in place that the system hopes will turn them around. "I kind of walked into a stalemate situation where the district and the community didn't want [a takeover] and the state said this is what's coming," Johnson said. "We felt like we were able to create a solution that everybody could live with and is most importantly what was best for students." Hamilton County Schools Superintendent Bryan Johnson talks with Jamie Parris about work being done in a curriculum mapping workshop at the Hamilton County School building on W. 40th Street on Thursday, July 12, 2018, in Chattanooga, Tenn. Johnson is wrapping up his first year as superintendent. What's Next: Future Ready 2023! Coming from the Clarksville Montgomery County school system, one of the top-performing school districts in the state, Johnson has been candid about the reality of performance in Hamilton County and his goals for the district. "This isn't where we want to be, or where the state wants us to be," Johnson said at a recent board meeting after last year's TNReady scores were released, which showed the district's middle and high school students continue to lag behind their peers around the state. But Robertson has praised Johnson's approach. "You've got to have that realistic conversation," he said. "It's been probably hard for him, but we don't want to ignore the fact we've got to do better. He's talked a lot of diagnosing the problems and prescribing solutions." School board and community members have also been candid about their desire for someone determined to improve the district — and who is realistic. "Given what Dr. Johnson stepped into, I think he has done a good job," board member Joe Smith, of District 3, said after the superintendent's evaluations released earlier this month. The district's new five-year strategic plan focuses on the concept of being "future ready," a theme of Johnson's first year. His vision includes preparing students for the workforce or continuing education after high school, streamlining operations and hopefully becoming one of the top-performing districts in the state. That theme is central to one of his largest initiatives so far: the Future Ready Institutes. As part of the program announced March 15, about 20 small learning academies will be embedded in the district's traditional high schools. Each will focus on a specific industry theme — such as aviation, mechatronics, manufacturing and health sciences. It's been a massive undertaking, said Bigham, one of the program's main partners. "He's definitely got a backbone," Bigham said. "Most new [superintendents] would not have taken on something as ambitious as the Future Ready Institutes less than six months on the job." The work that has gone into the institutes — navigating business partnerships, pitching the concept to get the community onboard, and reorganizing school structures to allocate the necessary resources — highlight Johnson's skills as a businessman and the ease in which he can approach the operational side, as well as the academic side, of his duties. "That's been our focus as we converse with groups, this is where we are headed as a system," Johnson said. "Now let's figure out how we work together to get to where it is our system really desires to go." What's one of his biggest challenges this year, or "growing points," as Johnson calls them? Hamilton County Schools Superintendent Bryan Johnson meets with personnel at the central office building on Thursday, July 12, 2018, in Chattanooga, Tenn. Johnson is wrapping up his first year as superintendent. Though it's not an elected position, superintendents traverse the lines among educator, businessman and politician. One of his biggest roles this year was to pitch a budget to be presented — and he hopes approved — by the Hamilton County Commission, as well as navigate the hurdles thrown his way. Last fall, Signal Mountain was considering seceding from the district; a loss of some of the highest-performing schools that could have been devastating. In the spring, after the massacre at a high school in Parkland, Florida, Johnson stood alongside law enforcement officials as the community demanded safety improvements for schools. He also attracted criticism after proposing retirement incentives that some felt were meant to clear house and entice the old guard to retire. Two of his board members — who are also his bosses — released a statement denouncing a report from UnifiEd, a local nonprofit and district partner, and calling into question some of Johnson's own decisions to create an Equity Task Force to look at issues of segregation, access and the challenges that poverty presents children across the district. "I think, unfortunately, the word and the framing of what we call 'equity' or what we call 'closing the opportunity gap' has been mischaracterized," Johnson said. "It has been made into a racial issue, a political issue. It's none of those things, but it's all of those things. It's about every single child getting access to what they need in order to be successful." "We will continue that conversation," he added. Johnson said one of his most important jobs is to limit the number of distractions that can get in the way of the school system fulfilling its responsibility to teaching and learning. "I'm not a fan of politics. That is just the reality. But it is a political role, and that's been the biggest learning point for me this year," Johnson said. "What we do know how to do is schools ... I also understand that if I'm not successful in all of these roles, children suffer." Johnson acknowledges that is an area he would like to improve upon. In his second year, he hopes to establish stronger business relationships — he is working closer with the United Way of Greater Chattanooga in the coming year and is a new member of the Rotary Club of Chattanooga. A competitive man, Johnson has also laid out ambitious goals he believes the district can accomplish, including becoming the "fastest-improving district in the state" and eventually overtaking state scores in student performance. "We will never be error free, but we want to be as error free as possible," he said. Johnson said one of his strategies is anticipating what could go wrong, and working to efficiently prevent that — whether that is through improving safety measures in the district's 79 schools or focusing on the middle school years, as he has directed the district to do, to combat statewide trends in underachievement in middle school. Though this year's student performance continued to trail the state, as is evident in the dismal test scores released earlier this month, many across the system and the community also believe Johnson has set the district up for improvement and success. "Our job is to say, 'This is our direction, this is where we want to go,'" he said. "I'm really anxious this year to dig in even deeper and say, 'OK, how do we get to where we want to go?'" For now, he's arranged the furniture. But time will tell if he will rearrange it again.